Admission: Free. Donations are welcome! The Department of Geology and Environmental Geosciences is home to a Paleontology Museum that displays almost 1,000 fossils. 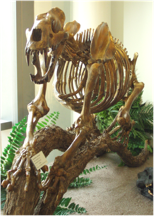 The displays includes: dinosaur bones, crinoids, Oligocene mammals of North America, mosasaurs, cave bears, Pleistocene mammals of the Carolinas, ocean life through time and fossil plants. 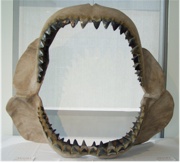 A favorite exhibit for many is the reconstructed jaw which houses real teeth from the giant extinct shark Megalodon. The Museum is open to the public and manned by geology undergraduates who work as student docents. Groups that would like to schedule a visit to the Museum should call 843.953.3967 (Museum direct line), or email museum@cofc.edu. The academic staff in the Department of Geology and Environmental Geosciences often give their time to delivering talks on their research and teaching specialties to groups visiting the Museum. These tours are ideally suited to 9th grade students and older. Younger age groups are encouraged to visit the Museum, but we currently do not provide staff-led tours. We ask that leaders of younger groups (K-8) provide self-programmed visits, but please still book a time slot with Museum staff, given the space we have is limited. We ask that all visitors to the Museum, especially large groups, respect the teaching environment of the College of Charleston, given classes take place immediately next door to the Museum. We ask that group leaders visiting the Museum maintain control of their group and restrict each group to no more than ~20 students (with chaperones). If a group is noisy and/or disruptive, they will be politely asked to leave the building. As the museum continues to grow, your support is greatly appreciated. Please choose "other" when donating and use fund number R548 when you visit the Foundation giving page. If you have unique ways to contribute to this wonder museum, please contact Sarah Michalies (Collections Manager).